Spring has definitely come to the farm. Marsha’s iris plants are in their full purple glory, the fava beans are in their fat green pods heavy on the vine, and the roar of spring training games can be heard in the back field. Another spring ritual was also taking place this morning. Sean was helping along with a little budding romance, so to speak. 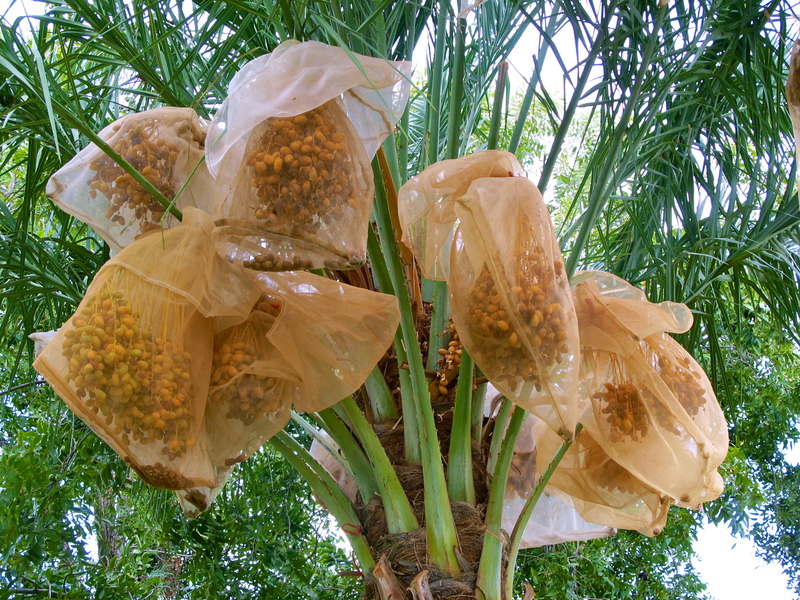 Every year around this time bees go nuts around the date palms. We have two male date palm trees in the orchard that are in bloom at the moment, and rather than wait for nature to take its course, we are having to help out a little. 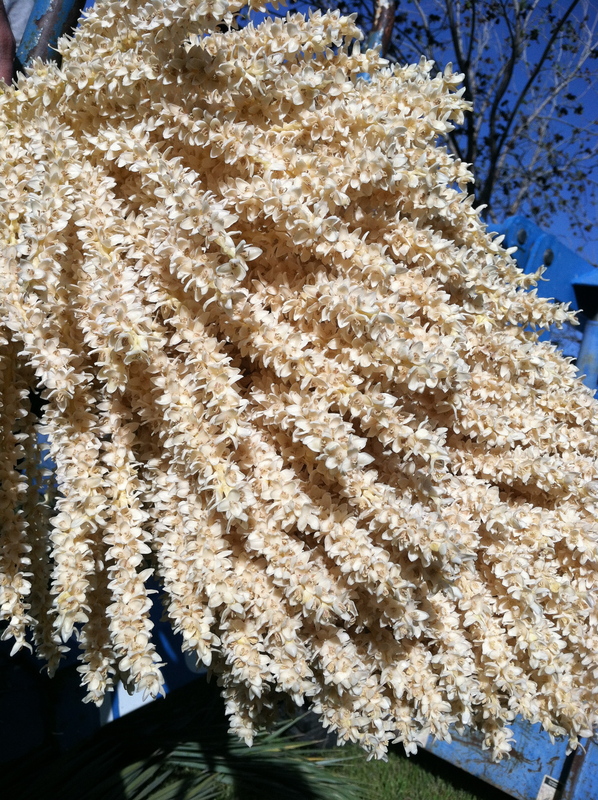 Date trees are traditionally wind pollinated. However, this only works if there are the same ratio of female to male trees. Since only female trees bear fruit, we can have a more abundant harvest by having more female than male trees planted. One male tree can pollinate up from 50 to 100 female trees with a little assistance. The bees do their part too in spreading pollen, but only to a point. The bees work also better when the ratio is even. So, this morning, Sean was helping out with in the dating game. Both the male and female buds on a date tree are called spath, and they open naturally when they are matured. To manually pollinate the date trees, Sean had to first cut the spath from the male trees. In some areas of the world where dates are grown, pollinating and cultivating date trees involves the agility and skill to climb a 60-foot ladder balanced or tied to a tree, while carrying a machete to trim the tree while making the ascent. 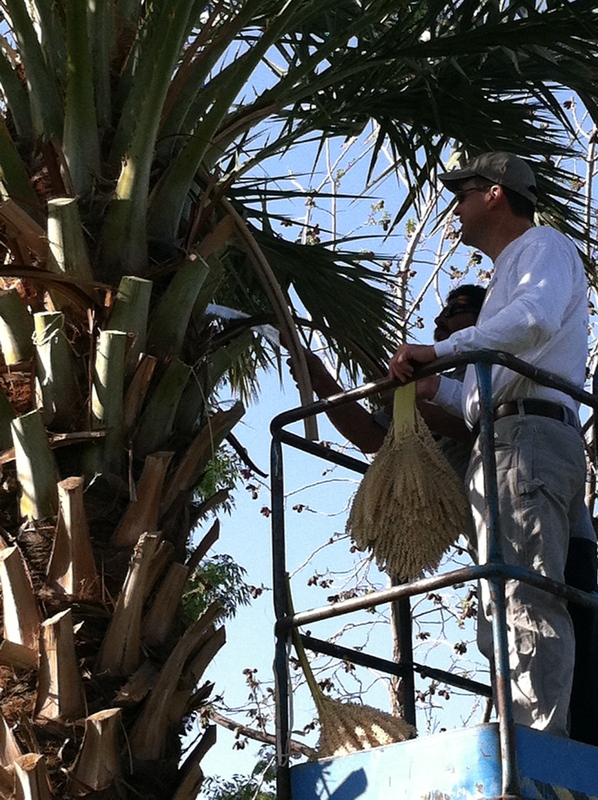 Once at the top of the tree the palm fronds in the way need to be trimmed, since they have razor-like thorns that will slice your hand. Sean thankfully was able to use a genie lift instead going up a ladder with a machete. I was grateful for that. Once he has the spath from the male tree, he then uses the genie lift to reach the top of the female trees and then the pollen is shaken over the spath in those trees. It looked like yellow puffs of smoke up in the trees. Dates have been a diet staple in the Middle East for thousands of years. They are believed to have originated in the Persian Gulf region. There is evidence that date cultivation goes back as far as 6000 BC. Later traders spread dates into Northern Africa, Southern Europe and Southeast Asia. They were introduced to Mexico and the U.S. in the 1700s. The uses and roles of dates in history are as varied and widespread as their nutritional benefits. Ancient Egyptians used dates to make wine and medicines, some Arab cultures would grind up the date seed to use as a flour for breads, others would cook the leaves from the palm hearts and eat as a vegetable. Their importance was such that the date motif has been incorporated into historic and decorative symbols from the mosaics of Byzantine Rome, to the Dome of the Rock in Jerusalem and the Great Mosque in Damascus. The Saudi Arabian royal emblem has a date palm in its center. 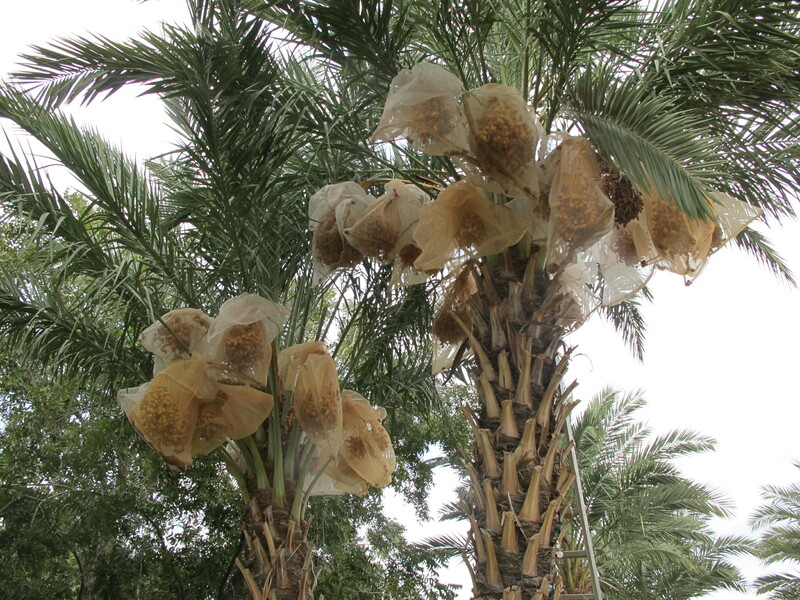 Date palms have also been recognized across different faiths with mentions throughout the teachings of the Jewish, Islamic and Christian religions. The upcoming Palm Sunday owes its name to the fourth century observances in Jerusalem, where the faithful gathered on the Mount of Olives and proceeded through the city carrying palm and olive branches. With their ability of flourish in dry climates and to keep for long periods of time when dried, dates were a necessary staple for survival. High in fiber, iron, calcium and more potassium than bananas, they are wonderful for muscle development. They have also been cited as having a number of medicinal benefits and are apparently good for curing a hangover when they have been soaked in water overnight. 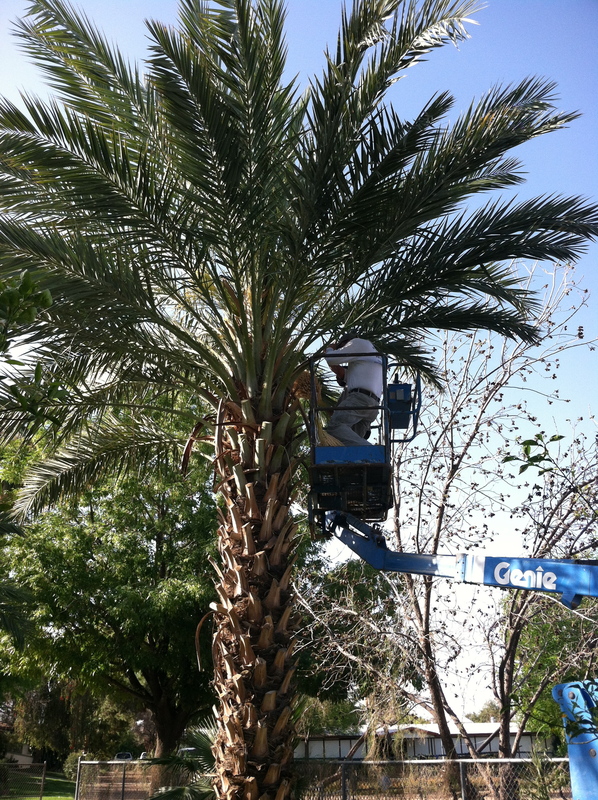 With all of that said, I am glad Sean was able to help the date palms along this morning. Because dates are also pretty tasty with a little blue cheese, honey and a nice glass of wine.